Monthly waterconsumption (in this document, MW) tell us the amount of water that every family uses during a month. Logicaly, they’re several differencies beetwen countries, and beetwen all the months of the year (it isn’t the same february than july). The used metodologies present variations. Some of the participants have made the measures in liters (EU, liter as L); other ones in cubic meters (m3; each m3 is equal to 1000 L). By the other hand, some of them have measured waterfootprints from january to december, or of february to february of the next year. You have to make attention to this, when you’re reading our conclusions. We try to compare water consumption usual of the countries that have participated in the Eurowater 2015 program. Here you are the results of the countries that participe in Eurowater 2015. MW for Oude Pekela school (the Netherlands) in liters. MW for Wittmund school (Germany) in liters. We can’t extract a clear conclusion about the variation of water consumition, except that the pattern of València (South) is very different than the other two places. MW of february to february of the next year in different families at Grossefehn (GE). Average MW for different families of Grossefehn school (GE). Average MW for different families of Zespót Szkót school (PO). Average MW for different families of Vestergaardsskolen school (DK). The Yearly waterfootprint (in this document YW) expresses the amount of water wasted in a natural year. It’s a good parameter to comparate, cause shows clearly the differencies between countries. In our case, the countries that participated in the event. Note the high variability in results, from 400 to around 1375 liters per year (more than 300%). 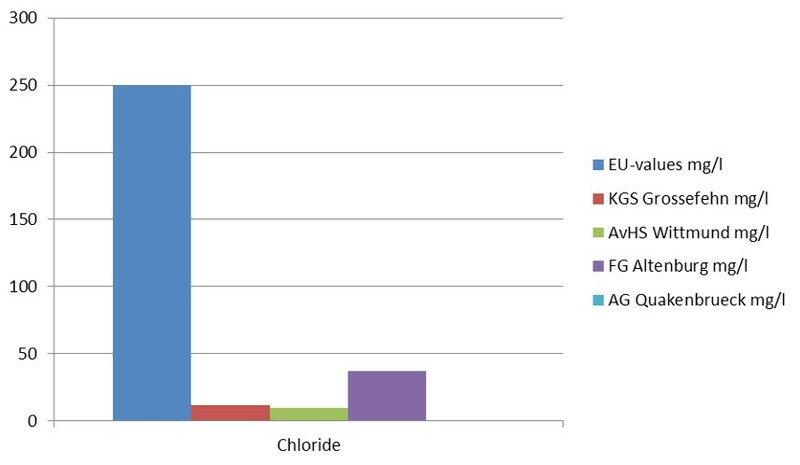 Comparing the measured values from the four german cities and the EU-values one can see that the quality criteria for proper drinking water are met either at Grossefehn, Wittmund, Altenburg and Quakenbrueck. Iron is a metal. The number of the iron in the Periodic Table is 26. It’s important for plants and animals, but if there is too much it is dangerous. 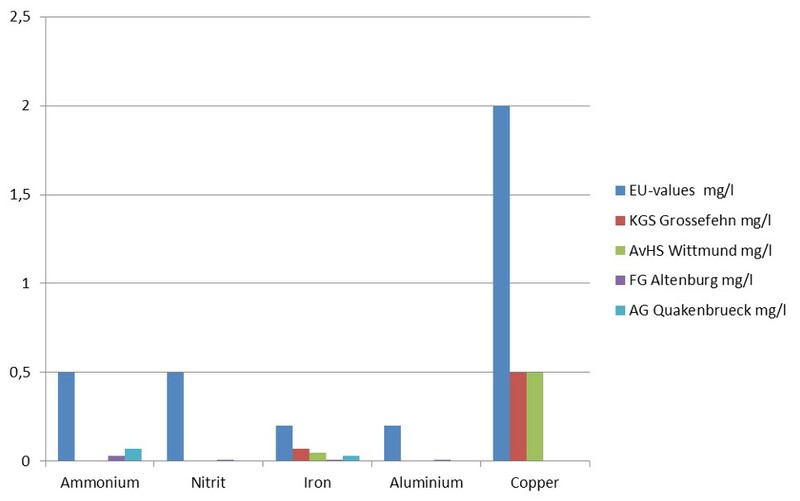 The contaminated water with iron has usually got bacteria of iron. This bacteria eats the minerals that are in water. This bacteria doesn't do any problem to the human body. This bacteria leaves in water tanks pipelines. You can find iron in important minerals. If it rains the iron is removing from the minerals and it goes in to the water. Iron is important in the human body for the rain and the blood. If there is too much iron it will be stored in the liver and in other organs. But if there is too less iron you can get anaemia. Hydrolysis is a form of Ion removal, Ion Exchange an others. 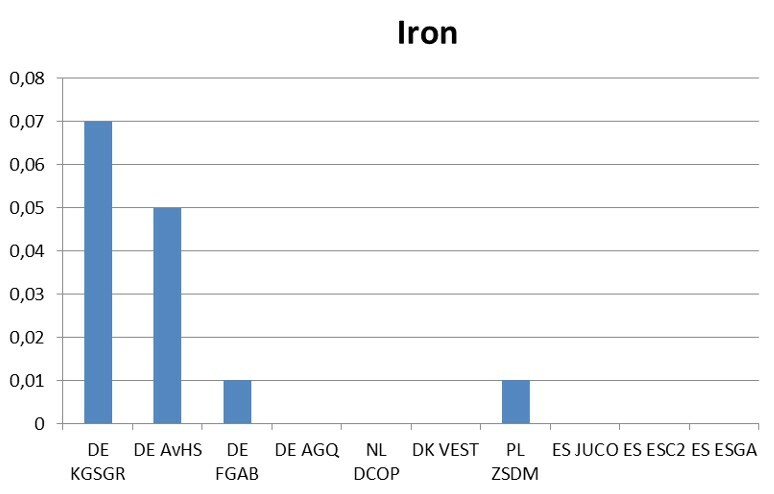 The Euronorm for iron in the drinking water is 0,2 mg/l. Our results are significantly fewer than this value. The water in all schools is okay. Phosphate : as an inorganic chemical is a salt of phosphoric acid. In organic chemistry is an ester of phosphoric acid. 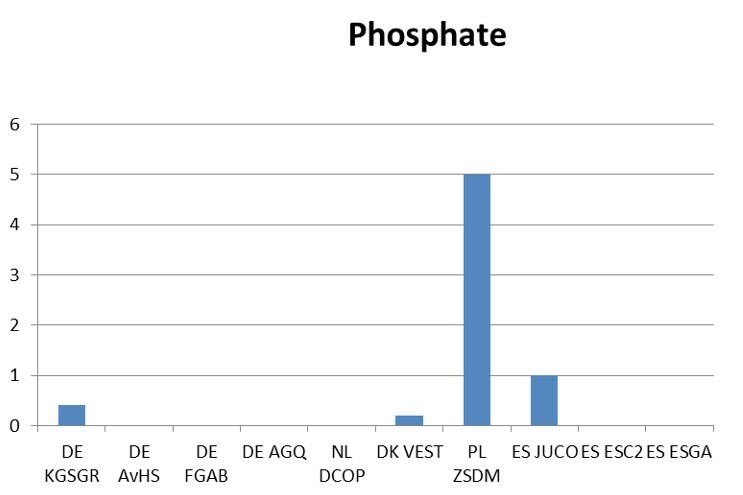 Inorganic phosphates are mined to obtain phosphorus for use in agriculture and industry. At elevated temperatures in the solid state, phosphates can condense to form pyrophosphates. All plants and trees need phosphate otherwise they will die. Farmers need to add phosphate to their crops otherwise they will die to. The European limit for Phosphate is 6,7 mg/l. All schools are below this limit. 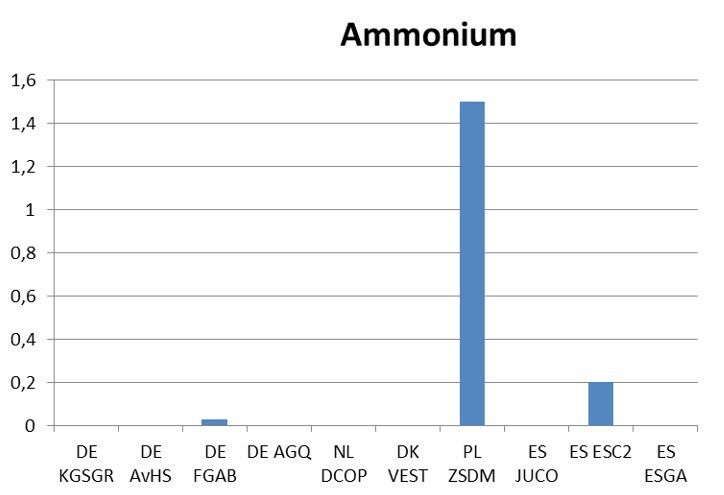 Ammonium : the ammonium is a cation which reacts chemically similar such as alkali metals and salts corresponding forms forme . Ammonium forms a dissociation equilibrium with ammonia because of the involvement of oxonium is this balance of the pH -dependent. The school in Poland is over the Europeanlimit of 0,5 mg/l. The other schools below the limit. Nitrate salts are found naturally on the earth and is a major source of sodium nitrate. Nitrate is used in agriculture as fertilizer. Cars and industry produce nitrate too. Nitrate is importing for plants, they need it for growing. Too much nitrate in open water is not good for the plants in the water because then they grow too fast and then use too much oxygene. 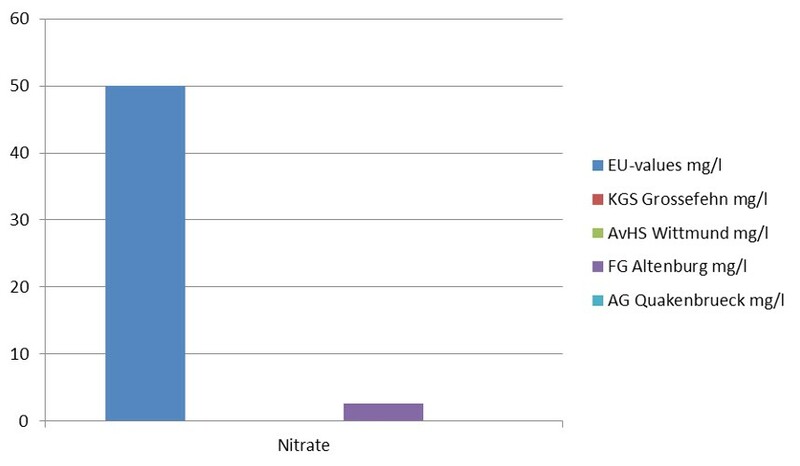 For a human Nitrate above 50 mg/l in the drinking water is unhealthy. 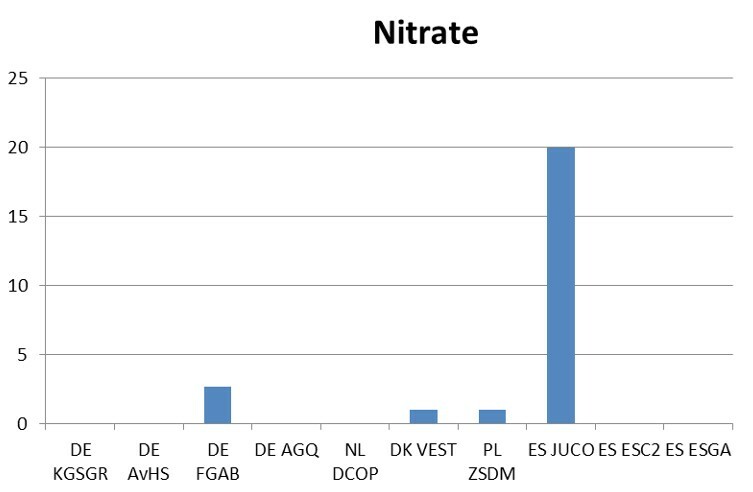 The results of Nitrate are okay, all schools are below the european limit. In East Friesland, it is very flat and there is a lot of water from the North Sea, the many lakes and rivers .The North Sea is famous by the protected Wadden Sea. It can be very dangerous. Some visitors underestimate how fast the water coming. On the coast are dams with a lot of sheep graze on it. Inside the Inland are many farms with pigs, cows or chickens. Everybody can see the big farms with big plow and machines. In Eastfriesland live 465000 people within a radius of 3144.26 square kilometers. Eastfriesland has got the East Frisian Islands (from west to east) Borkum, Juist, Norderney, Baltrum Langeoog, Spiekeroog and Wangerooge. Across the North Sea, there are sometimes floods by big storm. In Ostfreisland ist es sehr flachen und gibt es viel Wasser von der Nordsee, den vielen Seen und Fluessen .Die Nordsee ist bekannt durch das unter Naturschutz stehende Wattenmeer. Was jedoch sehr gefährlich werden kann, weil manche Besucher das schnell kommende Wasser unterschätzen. An der Küste Ostfrieslands sind meist die Dämme zu sehen wo Schafe drauf grasen. Im Binnenland sind sehr viele Bauernhöfe mit Kühen, Schweinen oder Hühnern. Die landwirtschaftlichen Betriebe sind auch nicht zu übersehen mit ihren großen Äckern und Maschienen. In Ostfriesland leben insgesamt 465000 Menschen im Umkreis von 3144.26 Quadratkilometer. Zu Ostfriesland gehören noch die ostfriesischen Inseln (von Westen nach Osten ) Borkum, Juist, Norderney, Baltrum, Langeoog, Spiekeroog und Wangerooge. Durch die Nordsee gibt es manchmal Überschwemmungen durch große Sturmböhen . In Valencia we have a widely diverse landscape with many kilometers of coastline and beaches along the Mediterranean. It is on the east coast of Spain between Cataluña, in the north, and Murcia in the south.The area has both high mountains and plains, wetlands and beaches with large areas of sand .It is a flat community which slowly rises from the sea to the inner part. The influence of the Mediterranean sea affects the temperature in all the coast producing that the temperature usually increases in summer time but it stays the same the rest of the year . We have learnt that in the North of Europe, swamps are a part of the landscape. In Valencia the most similar thing is the lagoon called Albufera which is surrounded by kilometers and kilometers of rice fields Water in this lagoon is mixed with water from the sea and it is used to irrigate these crops. In our area there are not many rivers and most of them have little water although some times, if we have heavy rain during some days , there may be floods in some areas.We think this is due to the lack of trees and roots. Water is not absorbed so that it drags from mountains to valleys . We think more trees should be planted . Although the mountains in Valencia are high, it is never freezing cold to have snow, so we can not use the water generated by melting. The only water we can use is the one produced by rain, which is not enough.